#1,568 Be Knot Afraid. – Laurel Mercantile Co.
Now reading: #1,568 Be Knot Afraid. I was completely surprised this afternoon when Rosemary, one of our youth moms from the church, pulled into the driveway with a gift for me. 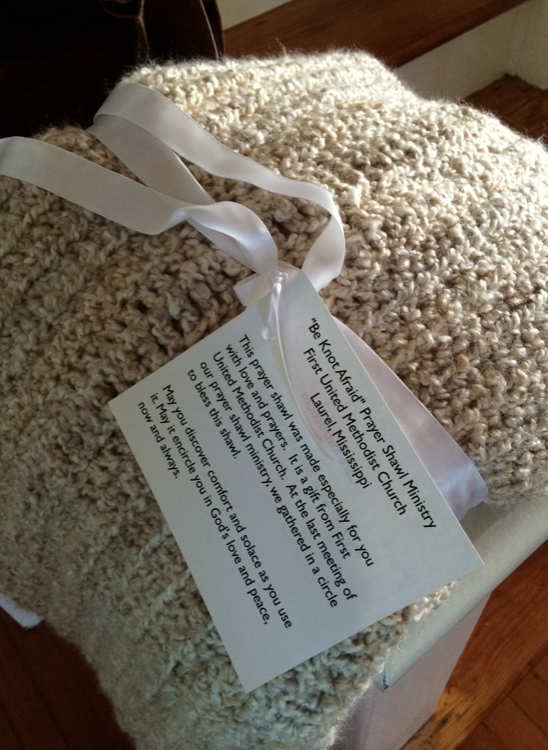 She’s part of the Be Knot Afraid ministry, in which a group of women from our church each take people from the prayer list who are sick, expecting babies, or facing surgery, and they knit a blanket for that person and pray for them as they do it. Then the group prays over it all together before they give it to the person. I’ve brought up names for them in the past and even had the great pleasure of giving one of their prayer blankets to a friend’s grandfather who was in need of prayer and comfort during an illness… But I’ve never been on the receiving end of this particular ministry. I was reading on the front porch when she came by and I nearly fell out of my chair I was so excited to receive my very own prayer blanket. What extravagant love and kindness! I couldn’t believe it. It’s huge, fluffy and cottony. Such a precious surprise and tangible reminder of God’s love for us. #1,569 Up On the Rooftop.